Again, I realize I’m being vague with the ingredients. Dad told me to get sirloin tip roast with the cap off, but then he said that because of the cooking method it wouldn’t really matter. So I got 2 small rump roasts. It’s way cheaper and I just tasted it, it’s perfectly fine. If you want, marinate the meat in the Italian dressing overnight. You can do this right in the roasting pan. I did not use the Italian dressing method this time for a couple of reasons. One, I didn’t make it to the store until this morning. Two, it gives the meat a tangy flavor. While I LOVE love this flavor when this recipe is used for sandwiches, I prefer not using it if I’m doing this as a main dish. It’s up to you. Get one of those big roasting pans with a lid. The kind they sell at WalMart for $12, you know, they’re usually blue with white speckles on them. Put the meat in there. Slap a little salt and pepper all over the meat if you didn’t marinate it. Roast the meat, lid on, at 220 degress for 7-8 hours. And that’s it. I swear. Don’t mess with it, don’t turn it over. Just leave it in there as your house starts smelling good and random dogs start howling. When it’s done, remove the meat to a plate and let it cool. I poured the drippings into a bowl, stirred in some ice cubes, and let the juice sit in the freezer for about 30 minutes. That allowed the fat to rise to the top so I could skim it off and throw it into the garbage can. Not the sink. I know I gave this warning in the recipe for Chicken and Dumplings, but it bears repeating. Do not put fat down the sink. It will harden and clog your pipes. Okay, I’m done. Once you’ve skimmed the fat, pour the juice into a large pot. I had a lot of meat, so I made a lot of gravy. I added about 1 1/2 cups of water, a dash of Kitchen Bouquet, and then whisked in the gravy mix. Then I brought the gravy to a boil. It wasn’t getting thick enough, so I made a slurry of cornstarch and water and whisked that in while the gravy was boiling. Then I cut up the meat and added it to the gravy. Okay, I sliced some of the meat and then the rest started falling apart because it’s VERY tender so I just went with it and let it do its thing. 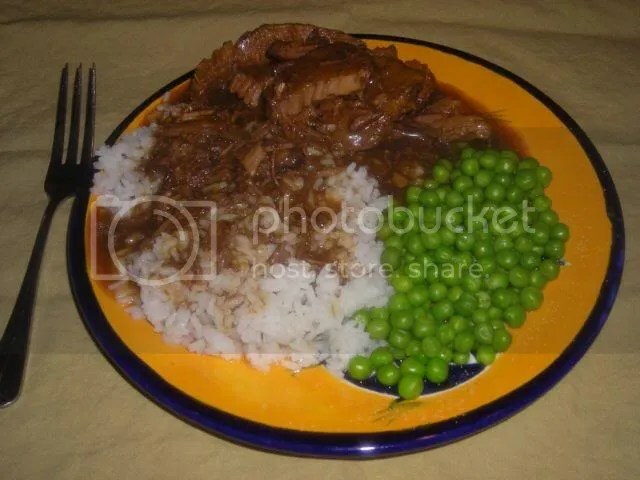 I’m serving this with rice (because I LOVE rice and gravy, especially left over the next day) and peas. And I’m freezing half of the meat and gravy to use in a week or so. This is my new thing — freezing food for future dinners. And I would like to point out my lovely alliteration in the previous sentence. You are currently browsing the Fixin' to Eat blog archives for March, 2009.